Un putain de souvenir de dingue ! 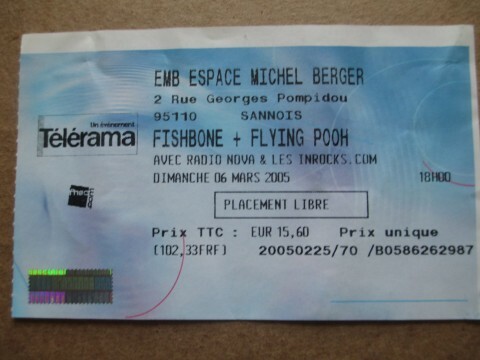 En première partie Flying Pooh, un groupe de métal violent qui envoie du lourd. Pas trop mon style mais ca pogote et la salle est chaude pour l'arrivée de Fishbone. My first time seeing them live...wonderful memories, crazy show, and more than 3 hours of music!! !The sound engineer recorded the show, but my audience recording went out after the 120 min tape flip...I went back home to listen to the tape, and, a very nice surprise : The DAT tape was empty!! !the heads of the corder were out!! !, hopefully the memories are still there! 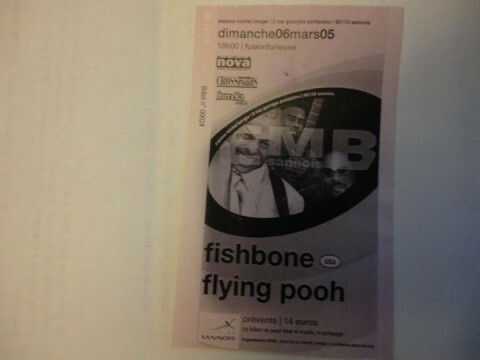 Fishbone is not scheduled to play EMB anytime soon.